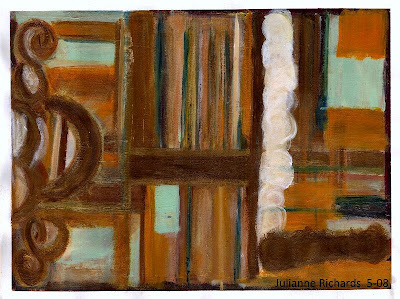 Julianne Richards: "The Colorspeaker": "the Unknown V"
This is the fifth piece in a series of paintings, which are not "exact" in their likeness, but similar stylistically and in an emotionally conceptual collective, and it doesn't hurt that they have been well received and selling! Acrylic paint and mediums on 18"x24" heavy paper, with a half inch white border around entire painting. Then finished with a UV protective gloss varnish (two coats).Shimmering, rustic,and warm colors- and both linear and soft imagery in this layered abstract vision. ...and very beautiful. I can see why it sells so well. This series reminds me so much of music...can you see the lines and the instruments? Again, more beautiful work from you, Julianne! As always, it is a pleasure to hear from you-your words are always welcome! It is lovely to see your work again, my friend! I watch what happens here, as you know!